I couldn’t decide what to read next, but knew I was looking for a fun and lighter read. When I noticed Camp Forget-Me-Not on my shelf I knew I had found my next read. I loved the first two books in this series and I knew I would enjoy this one too. 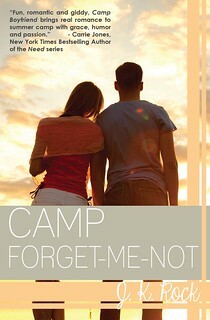 Camp Forget-Me-Not is a fun and enjoyable story. It’s always a pleasure to be back at camp in this series, although it took me a bit too realize this book takes place in the same summer as Camp payback. I also like the focus on self development and change these books always have. And the camp setting is just great. Concerning the characters it’s always fun to see everyone again, although this book focusses on a camper from the Diva’s Den, so we get a slightly different cast of character then before. I enjoyed seeing the Diva their point of view and realizing their not so mean and popular as I thought in the first book at first. It was fun to get to know these characters, although it can be tricky to remember who’s who due to the huge cast of characters. I liked seeing Alex from Kayla her point of view and how Alex and Emily were a big help to Kayla when she needed it. Kayla was the main character of this book and it’s told solely from her point of view. I liked Kayla as a character and could easily relate to her. Although in the beginning of the book she was a bit of a wallflower, she prefers to stay to the background and doesn’t speak her mind. Later in the book she changes and the changes in her character were one of the things I liked most in this book. It was fun to see her figure out who she is and wanted to be and at the end of the book I felt so proud of her and all the things she had done. There’s an especially touchy scene with one of the other campers towards the end that really shows Kayla her personality. There are also some scenes with younger campers as Kayla is doing the Counsellor in Training program. I liked seeing a bit from the younger campers and it made it easier to realize that there are a lot more cabins out there then the ones we read about so far. It was fun to see those kids interact and even change due to Kayla and Nick their guidance. The only thing that was a bit of a miss for me was the romance, I just didn’t feel it and I couldn’t care less about Nick. I liked they were friends before and I hoped we would see their friendship grow into romance, but there seemed a lot of hostility and miscommunication between the two of them. I didn’t like the romance scenes, they frustrated me and I just couldn’t root for the couple. I just wish they talked things through and we would get some fun scenes of them, but they are fighting with themselves and the other till the very end. I was a bit disappointed with the romance, although luckily the rest of the book made up for it! To conclude: another great story set at Camp Juniper. It’s so fun to be back at this Camp again and I loved getting the point of view of a Dive in this book. Kayla is a great character and I liked seeing her change and grow over the course of this book. It’s really about finding yourself and growing into who you wanted to be and the book carries some great messages like those. I liked getting to know the Diva Den campers a bit more and seeing Alex again, the main character of the last book. The romance didn’t do it for me unfortunately. All in all a great ending to this series, although I am sad there won’t be more camp stories. This stories really seem to find the best combination of light hearted and fun and dealing with some heavy issues, growing up an finding yourself. I really enjoyed all the books in the series so far. I am a bit sad the romance didn’t work for me as I really liked Kayla and Nick as characters. I really enjoy books where the characters grow and change over the course of the book, so I think I would enjoy this. I think the camp setting would be fun too! I’ll have to check out this series. The camp setting is so much fun! And in every book you really see the characters grow, they really change a lot over the course of the book. Every book deals with a different character, but there are cameo appearances of the earlier MC’s. I love this series!! I have to agree with you that Kayle is a wonderful character. I loved to get that sneak peak into the Diva’s life, it was long over due, and I loved to see them all grow up and lose their bad habits. I also agree that the romance wasn’t the best. Sadly, Nick didn’t do it for me. He’s attitude was awful and it took him too long to see it. This was not my favourite book in the series, but I still though ti was an excellent series ender. Like it gave me the closure I needed. I’m still looking forward to camp crush though. Even if I’m not sure about the couple in it. This wasn’t my favourite book of the series either, mainly due to the romance, but Kayla was a great main character and I liked seeing her change. The diva’s as a whole also grew up and it was nice seeing their point of views. And I agree it was still a great series ender, can’t wait to read the last novella!